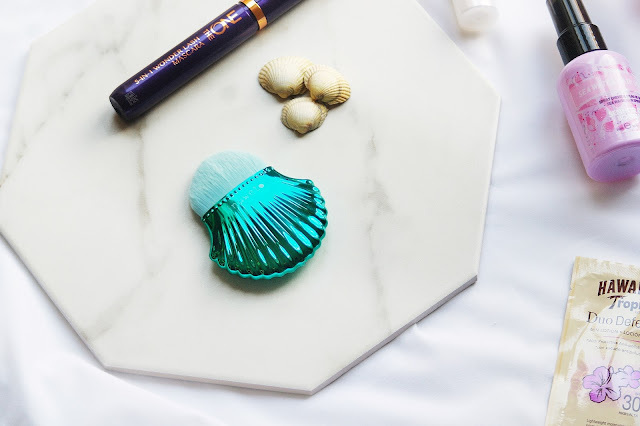 This month GLOSSYBOX is calling all mermaids to dive under the sea to get some of the most gorgeous treats this month. However I'm sorry I was a little late to the party, not entirely sure what happened with my box this month, but thank goodness it arrived! I must admit I really like the design of the box this month which is inspired by azure oceans and jetting off to a dazzling oasis. Have you noticed that we are actually having a summer, for the first time in forever. So as I am melting away writing this, let's see if this box is worth the hype. 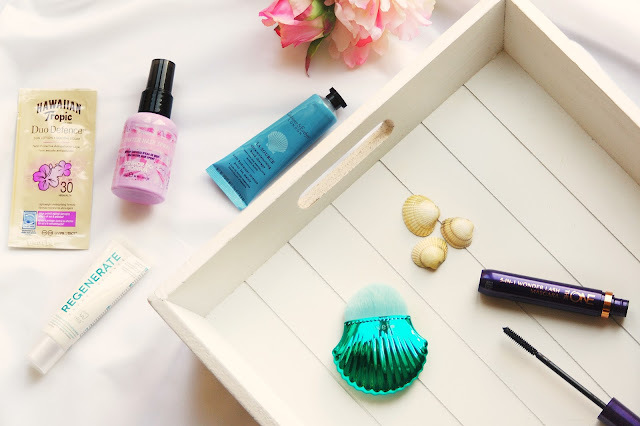 This Under The Sea GLOSSYBOX is jam packed full of beach babe essentials that are the perfect way to help you get the summer holiday vibes, whether it's gorgeous mermaid waves or sun kissed skin, GLOSSY have you covered. 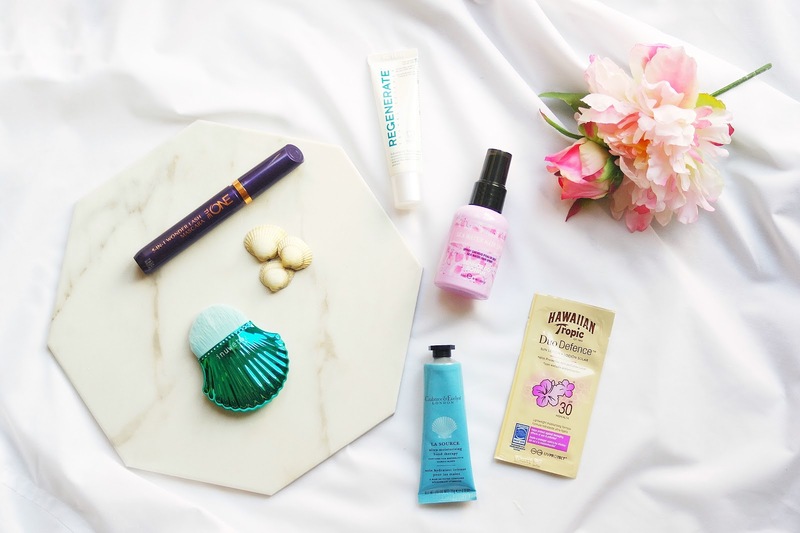 If you're new to Glossybox, it's a monthly subscription box that comes packed with both full sized products that cover all areas of beauty from skin care, hair, nails, makeup and everything else in between from brands we all love to those new discoveries that we wouldn't normally get to try if it wasn't for Glossybox. Each box costs £13.25 per month and contains contents that are always over the cost of the box. In a nutshell, you get a box full of goodies all for that monthly price. Not a brand I am familiar with but during the summer so many of us want to achieve effortless mermaid waves. This spray enhances curls without using any heat, all you need to do is spritz onto damp or dry hair and you're good to go. And it smells amazing! I think the only downside to it is that it seems quite pricey for the product, but I am hoping that this little bottle lasts me a while. Dry hands are just the worst. Hand cream is a must have essential all year round. However when it comes to deciding which hand cream is best for you, it is often a tricky one. 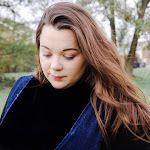 While some hands (like mine) may need a slathering of moisturiser to soften and protect them, there's nothing worse than being left with a greasy film on your hands. More often than not, it takes ages for the cream to work it's magic and you end up leaving greasy finger prints everywhere and anything you pick up slips through those greasy hands. And nobody wants that and so put your best palm forward and let me introduce a new hand cream that you will want to try. This hand cream is enriched with a marine blend of antioxidents-rich seaweed extracts and red sea algae. The hydrating power of hyaluronic acid also protect you hands with a moisture barrier. I have to admit I actually like the consistency of this one and it's definately going in my handbag this summer. So this mascara has many claims to live up to. So I was more than excited to try this as it claims to lift, curl, volumise, lengthen and separates the lashes. 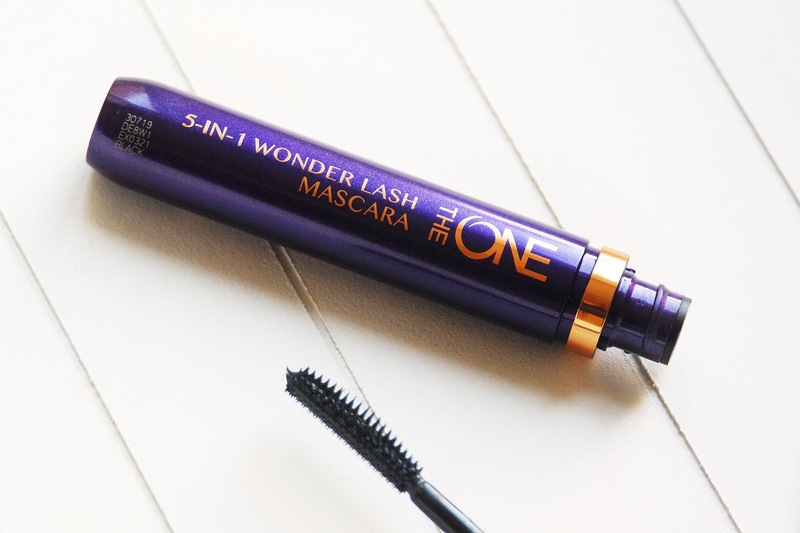 I am hoping that this mascara is going to give me beautiful lashes in less than no time. When it comes to choosing a mascara I always choose a plastic wand rather than one with bristles. So my favourite thing about this mascara is actually the brush. It’s super flexible in a neat conical shape to get right into those tiny lashes at the inner and outer corners of eyes. It seems to pick up just the right amount of product without overloading my lashes, so I am only need one or two coats. This wand contains lots of plastic bristles both small and large in a slight cone shape the brush is able to coat all the lashes with ease. The flexible wand moves on contact with the lashes so no pressure is needed. I have used this mascara a couple of times and if I am honest I was slightly disappointed. Yes it helped separated my lashes better than my usual mascara however failed to curls or give me eyes a great lash. However I will stick with it. Yes calling all mermaids I am sure you'll love to add this little beauty into your makeup brush collection. Like seriously how gorgeous is this brush? A little gem created by Korean brand, as we know that they know a thing or two about skincare so I am sure that they know ideal brushes too. 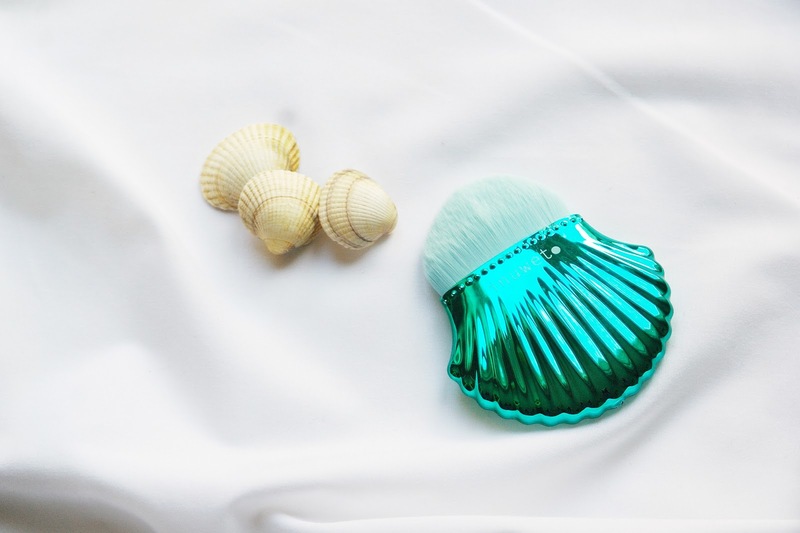 The Shell brush is perfect for precision contouring and bronzing. Bronzer is a must-have for a healthy, sun-kissed glow. Something else that my makeup routine needs a gorgoeous glow and this brush is perfect for highlighting the cheekbones, cupid's bow and nose. Bronzing and highlighting are perfect ways to get that post-holiday glow, even if you’re not jetting off this summer. Also in the box is a travel-size of a toothpaste that has a lovely minty taste and it cleans teeth very well. It’s also the first toothpaste to regenerate enamel and reverse the early erosion process. The formula contains a unique blend of enamel minerals that wrap around your teeth. I use this twice a day, and I’m hoping that over a bit of time, it works wonders. Finally, this month you get a handy little sachet of the amazingly-scented Hawaiian Tropic Duo Defence Sun Lotion SPF 30. This is great to keep in your handbag for an unexpected day in the sun. Protection is something that we all need. There are so many benefit to using sunscreen, by protecting you from harmful radiation from the sun, sunscreen reduces your risk for skin cancer, premature aging and sunburns. You can optimise your protection by choosing the right sunscreen, wearing it regularly and using it as directed. Just remember to apply sun lotion 20 minutes before sun exposure. In a nutshell, if you're a mermaid or want to be then this is the box for you. However, for me personally I really like the brush and mascara but nothing really grabs my attention straightaway, well in comparison to previous boxes. If you want to receive this box, you can get 15% off of July’s edition by entering the promo code WELCOME at checkout here. 14 comments on "GLOSSYBOX - JULY 2018: Under The Sea"
Well if this isn’t the coolest box ever I don’t know what is. I am obsessed with under the sea bits and beach themed beauty! Yes my daughter loves the brush. The theme of the box is so cute, reminds me of the little mermaid! Yes, it's a cute theme. That brush is just the cutest! I love this months box, however I didn’t get round to posting what I got because of a holiday getting in the way! The brush is so cute and the mascara was so handy as it came with me in my makeup bag! Love the box too! Looks like a lovely box! Yes, the brush was a cute addition to my collection. INNOVO® 12 Week Program - Does It Work?